If you are looking to buy a rowing machine then you are more than likely wanting to get the most for your money. The problem with this is that there are a lot of them to choose from and after sifting through all the different features and specifications, it can be hard-working out which one represents the best value for money. In this guide to the best rowing machine Australia has to offer we will be bringing you the best models in different price brackets in our top 5 reviews. All of the models featured come with excellent customer feedback from previous buyers which is a good sign of a top quality rowing machine. Before buying a rowing machine there are a few things worth considering, especially if you are to get the model that is best suited to your budget and needs. The following information in our buyers guide has all you need to know for choosing the best rowing machine. There are four different types of rowing machine resistance systems and each has its own benefits. The resistance is an important factor when purchasing a rower machine and each type of resistance has its own advantages and disadvantages. Knowing the difference between each individual resistance type will help in deciding which is best for you. Hydraulic – hydraulic rowing machines are the cheapest rowing machines available to buy. They use a piston or cylinder with compressed air or fluid to provide resistance. Magnetic – when buying a rowing machine it is definitely worth considering one with a magnetic resistance system. There are many benefits to this type of resistance. Due to the use of magnets there is no contact with the flywheel which means no wear and tear. Other benefits include low-noise and a smooth transition between resistance levels. Air – air rowers offer a very good amount of resistance as the resistance offered is determined by the effort put into each rowing action.You will find that these tend to be a bit more expensive than most magnetic resistance rower machines. Water – this type of resistance is considered to be the best and this is also why they tend to be the most expensive. 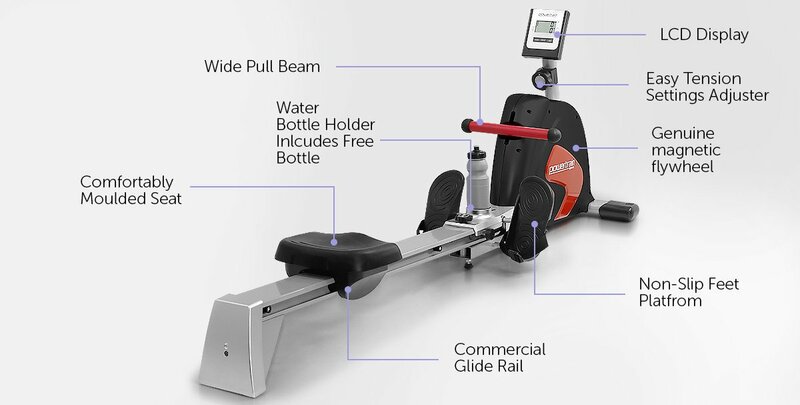 This type of rowing machine uses a patented water flywheel to mimic the movement of an outdoor rowing boat. The resistance is provided by water which is located in a tank at the bottom end. As the user pulls on the handle/cord the water is forced through the tank and drag is created. The monitor functions, also known as readouts, give the user vital data for their workout. The more monitor functions there are the better, as they allow the user to track any progress they are making over time. The main readouts to look out for are time, speed, distance, pulse and calories. You will find that expensive rowing machines come with a plethora of monitor functions and cheaper rowers with no more than four. Exercise programs ar an excellent way to keep motivated as they alleviate boredom. Generally speaking only mid- priced and expensive models will come with any exercise programs, however, there is the odd budget rower with a few programs. As with any exercise machine or home gym equipment the maximum user weight is a good indication of how well constructed it actually is. Rowing machines that are made from stronger and more durable materials will have a good maximum weight of 100 Kg+. A rowing machine made from inferior materials will have a very low maximum weight and should be avoided, unless of course you weigh nowhere near the max user weight. When buying an exercise machine it’s always a wise decision to check how long the warranty lasts. A very good model will come with at least a 5 year warranty on the frame and a couple of years on parts and labour. Cheap treadmills will have a warranty no longer than 1 year-long. The Powertrain Rowing Machine comes in at the lower end of the price range for rowing machines and is considered a budget model. There are many budget rowing machines available in Australia and to be honest, most of them are badly designed and made from poor materials. The Powertrain Rower is an exception and comes highly recommended for those looking for a budget rowing machine with some quality. Featuring magnetic resistance users can be certain of a quiet and smooth workout. The resistance is suitable for beginners and intermediate users, more experienced users would only get a light to moderate workout from this rower and therefore need something more testing. The LCD is easy to navigate and allows the user to set their workout based on a variety of different goals such as time, strokes or calories. With a 200 Kg maximum weight this is obviously a very well-built rowing machine and with that comes a sturdy rowing workout. Other features include adjustable foot plates for maximum comfort and a water bottle holder with a free water bottle included with every purchase. As mentioned there are a lot of cheap rowing machines available in Australia and hardly any of them give value for money as good as the Powertrain Magnetic Rowing Machine. With a solid design and a handful of monitor functions to keep users entertained, this one is worth checking out if you are on a limited budget. 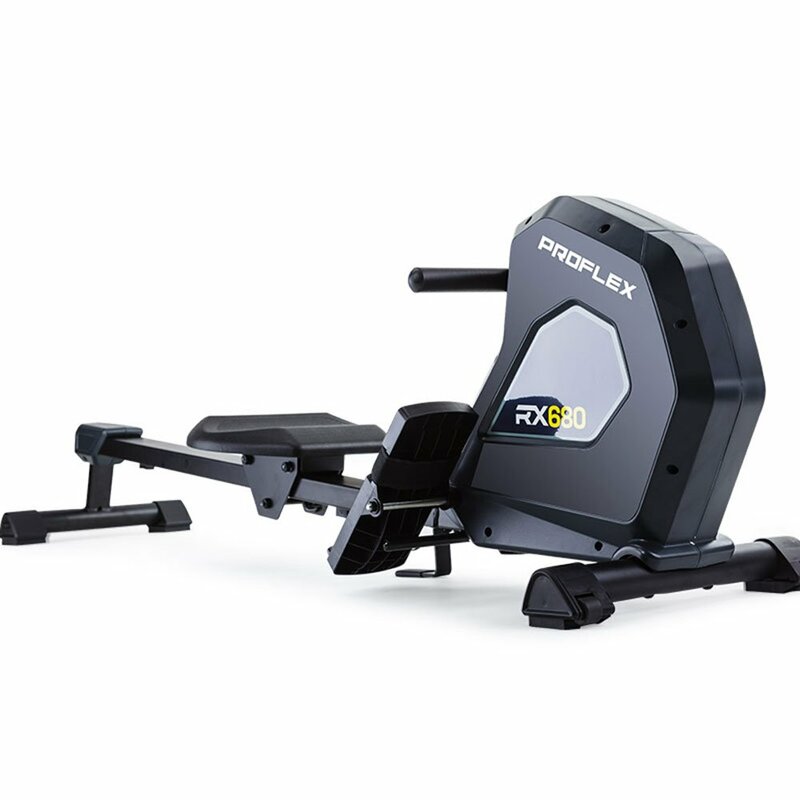 The Proflex RX680 has a very sleek and modern look which is a rarity for a cheap rowing machine, the majority of them look severely outdated. In addition to its modern design it is also a highly functional and very affordable piece of home exercise equipment. Featuring eight levels of magnetic resistance and with the highest setting offering a good workout, this is a good introductory rowing machine. In addition it also comes with eight workout programs for a varied workout. It features an LCD display that enables you to conveniently monitor workout time, stroke count and calories burned. With a good maximum user weight of 120 Kg the Proflex RX680 should be suitable for most people. The overall design is sturdy and the rower machine stays still when in use, unlike with some cheap and poorly built rower machines. Due to this been a foldable rowing machine is perfect for those with limited space in their home gym. In addition the built-in transport wheels make it very portable and easy to move. 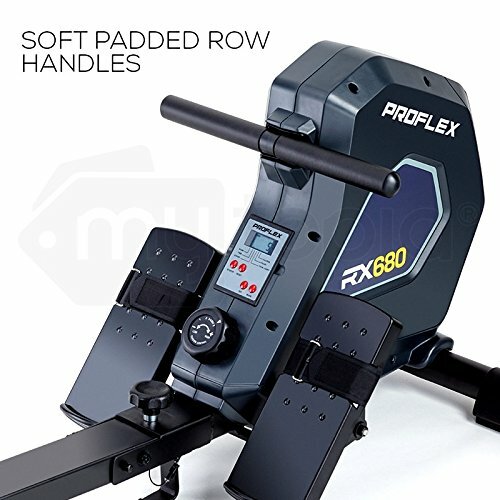 The Proflex RX680 offers great value for money as it does have some good features and specifications for a cheap rowing machine. If customer reviews are anything to go off, they usually are, then this rower machine is one of the top rated budget rowing machines in Australia. Bodyworx are well-known for their high quality rowing machines and they have a good range of models to choose from. From their budget to their top of the range models they have a lot to offer in terms of features and specifications. The Bodyworx KR170 Rowing Machine comes in at the lower end of the price range and is ideal for those looking for good quality at an affordable price. 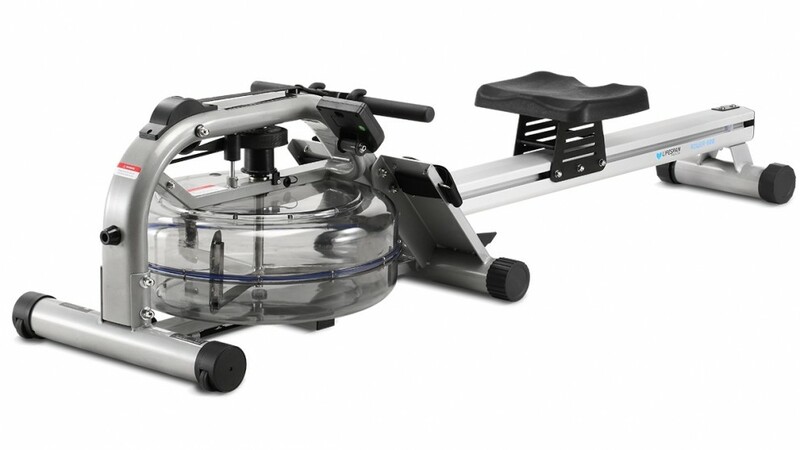 With an 8 Kg flywheel and 8 levels of magnetic resistance the KR170 is suitable for both beginners and intermediate users, as with all cheap rowing machines advanced users will probably need something with a bit more resistance. In terms of readouts there are 6 in total which is more than enough for keeping track of any progress. The readouts given are time, speed, distance, strokes per minute, total count and calories. With a maximum user weight of 125 Kg you can be sure this is a sturdy and robust model.In addition it folds up for easy storage making it good for those with limited space. Bodyworx are considered one of the best rowing machine brands in Australia and they have a very good reputation for producing excellent cardio equipment and exercise machines. The Bodyworx tops the poll in many reviews in Australia as the best budget rowing machine and we have to agree. With agood mix of quality and affordability it is well worth taking a look at if you are on a budget. or just not wanting to spend too much. As good as the previous models featured in our rowing machine reviews are, they don’t quite match up to the Endurance Magnetic Rowing Machine. In terms of quality this rowing machine has a lot to offer for a mid-range model. As expected it features a magnetic resistance system. In total there are 16 levels of resistance. The range of resistance offered varies from light to intense and this rower definitely gives the user a good workout on the highest setting. The LCD display is a step-up in quality from the ones you get with a budget rowing machine. Due to being quite large and backlit in blue, it is easy to see any workout data. In addition it is simple to navigate and only takes a short amount of time to fully understand what each button is for. In total there are six monitor functions and these are speed, time, distance, pulse, calories, watts and RPM. When using this rower it does give a good rowing sensation. This is mainly due to the four high-quality rollers. These give the user a smooth, quiet, yet solid sliding action during the most intensive rowing workouts. Other features include anti-slip foot plates and fully adjustable footstraps. The Endurance Rowing Machine is suitable for beginners all the way through to advanced users. With a good range of resistance it gives a beginner the chance to improve their fitness levels to a good level without having to invest in a new model with more resistance. The LCD has a host of functions for keeping track of workout data which is another positive. 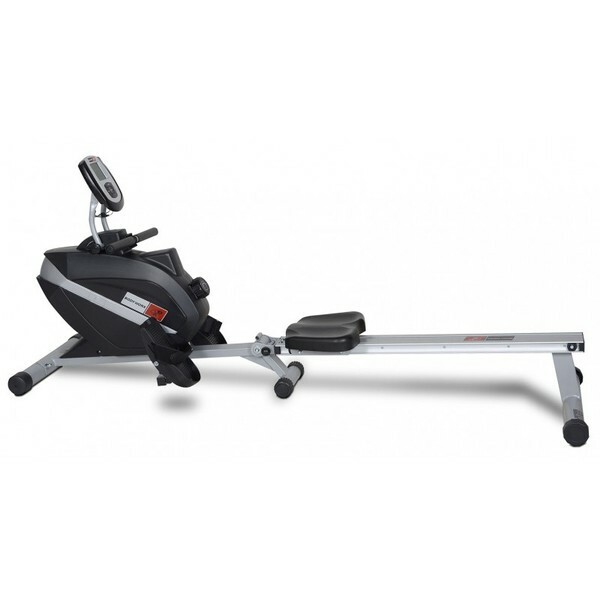 All in all this is a solid rower machine with a good quality/price ratio. Previous buyers seem to be very happy with their purchase rating it four out of five stars on Amazon. Lifespan Fitness are a brand that are well-known for their high-quality rowing machines. 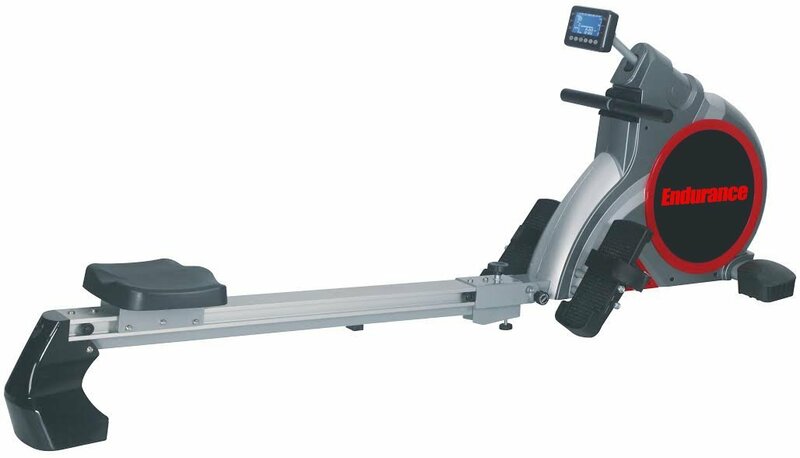 The Lifespan Fitness Rower 605 is a very popular model and is one of the best sellers in Australia in this price range. It’s features include a 7 Kg flywheel and a magnetic resistance system. In total there are 16 resistance levels and it has to be said the top setting will put even the most experienced users through their paces. With 18 dynamic and effective programs, it’s easy to get the personal trainer experience and reach your maximum performance with this model. There are 12 pre-set programs, 1 custom user program a race program and four heart rate controlled programs. The wireless heart rate transmitter allows the user to continuously monitor their heart rate to see exactly how hard they are working. In addition it allows you to pace yourself at the right intensity for the best results. All of the above can be controlled through the LCD display which also features six monitor functions. The monitor functions included are time, distance, calories, pulse, strokes per min and total strokes. All in all there is plenty to keep users entertained as they work towards their fitness goals. With a very respectable max user weight of 150 Kg this is a sturdy rower. In addition features such as the commercial quality rollers are a good indicator of how durable it is. Lifespan Fitness have done a good job with the overall design, features and specifications on the 605 Fitness Rower. In addition to been a solid and sturdy rower it also comes with all the features of a well-rounded rowing machine. With a wide range of programs and monitor functions this model comes highly recommended. Due to the folding option many claim this to be one of the best rowing machines for home use, we have to agree. The Lifespan Fitness Rower 800 features in many rowing machine reviews as a high-ranking model. If you are looking to buy one of the best rowing machines available, you should consider investing in the Lifespan Fitness Rower-800. Due to this been a water resistance rowing machine the resistance it offers is determined by the effort put into each row. If the user rows fast then there is a high resistance and if the user rows slow then the resistance is light in intensity. 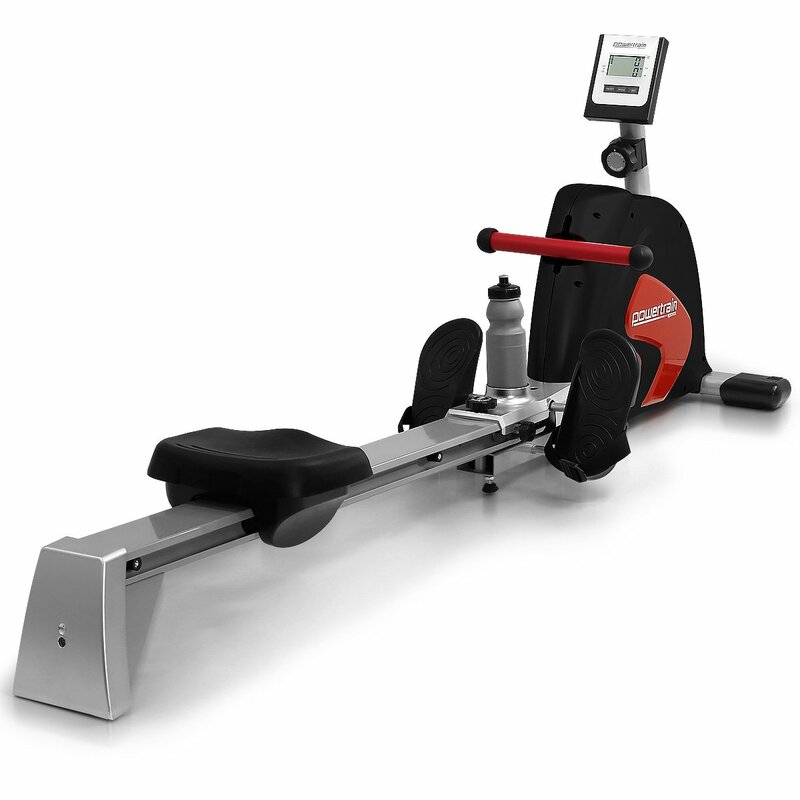 Due to this the Rower-800 is suitable for both beginners and advanced users. 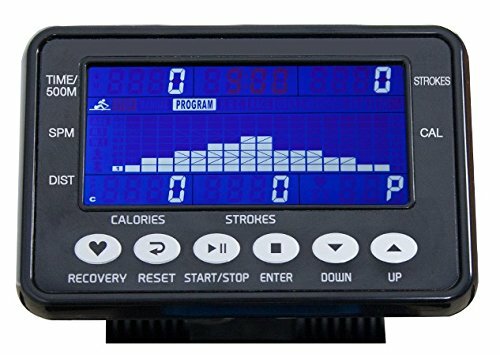 The ROWER-800 comes with a large, easy to read display to keep track of the time, distance, pace, calories, RPM and watts. With a max user weight of 160 Kg and the design emphasis been on heavy-duty parts, this is certainly a very solid and robust model. If you are serious about rowing as a form of exercise then its a good decision to buy one of the best rowing machines in Australia. The main benefit of the Lifespan Fitness Rower-800 is the pretty much unlimited resistance. Due to this feature, this model is perfect for beginners looking to progress over time. In addition it is also ideal for advanced users that are looking for a hard workout from the offset. As you can see there is a lot to think about before choosing the best rowing machine for home use. With the help of our buyers guide and rowing machine reviews you should be more informed for when it comes to making the decision on which model to go with. If you are new to rowing then you may want to buy a budget rower, the models featured in our reviews are some of the best sellers in Australia and represent great value for money. If you have been rowing for a long time then you will already be aware of the benefits of investing in a high-quality rower. In our opinion you can’t go wrong with the Lifespan Fitness brand as they have a good variety of high-quality models to choose from.